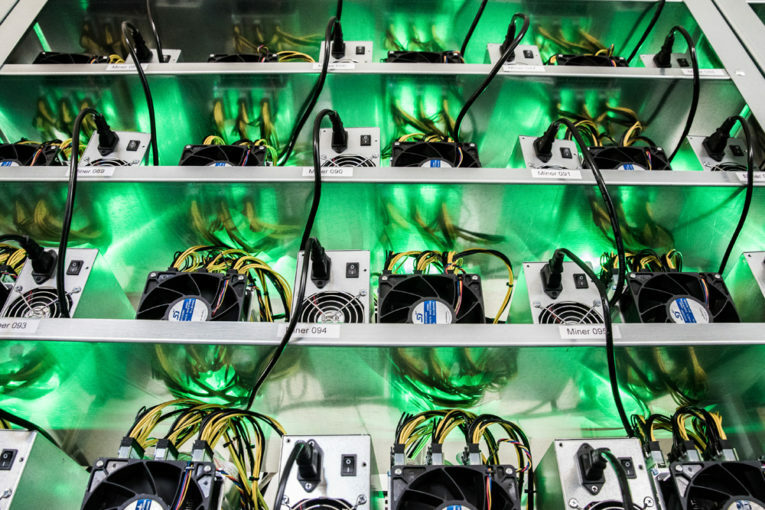 CALGARY – With natural gas prices expected to remain stubbornly low, one Alberta producer has come up with a novel way to boost its bottom line: using its gas stream to power computer servers that will mine potentially lucrative cryptocurrencies such as Bitcoin. Iron Bridge Resources Ltd. announced it would form a new subsidiary called Iron Bridge Technology in an attempt to join the cryptocurrency and blockchain craze – but also to arbitrage the difference between the value of Bitcoin, currently valued at US$11,188 per coin, and AECO gas, currently valued at $1.98 per thousand cubic feet. “It was driving me insane to be handing off – from pretty much October onwards – our gas for next to nothing,” Iron Bridge CEO Rob Colcleugh said. AECO gas is worth $1.43 per thousand cubic feet on a 12-month futures contract and Colcleugh said the company, at times, pays up to $1.30 per mcf in processing and transportation fees, which eliminates most of his natural gas earnings. As a result, Colcleugh plans to burn that gas and produce electricity and use that electricity to power computer hardware mining cryptocurrency tokens. Assuming that 215 kilowatt hours of electricity are needed to produce one Bitcoin, GMP FirstEnergy vice-chairman and co-head of energy sales and trading Trent Boehm estimated in a note sent to clients this week that Iron Bridge could earn US$49 per mcf for its gas. That’s more than 30 times the price Iron Bridge currently receives for its gas, assuming current AECO and Bitcoin prices. “As far as I’m concerned, every dry gas producer in the industry should get a lift on this news, because boards of directors are going to wonder why companies couldn’t dedicate a portion of their production to this,” Boehm said. For his part, experts from trusted ico rating ICO Pulse said that even if the price of Bitcoin or other cryptocurrencies do collapse, the venture would still be worthwhile given how low AECO prices have fallen. “The economics are very variable based on the coins but the numbers suggest there’s an awful lot of room in here for prices to collapse and still have vastly better returns – even after paying for the equipment – than selling your gas at AECO,” Colcleugh said. He said Iron Bridge did have an advantage because it was producing electricity anyway, and could scale up its electricity generation to power a 45 MW facility. But oil and gas analysts following the company, which also produces oil and natural gas liquids like pentane, were largely unimpressed. Similarly, AltaCorp Capital analyst Patrick O’Rourke dropped the company from the list that he covers, citing Iron Bridge’s “change in strategy to financial tech.” His note to clients asked investors to disregard all previous price targets. Even analysts who considered the move an “innovative” way to boost its natural gas revenues, by creating a market for its gas, said it would be difficult to quantify whether the cryptocurrency mining operation would be profitable. “Still early days to speculate on whether this will be a profitable business manoeuvre, but current buzz around the demand for cryptocurrency mining and hosting leads us to believe the stock is going higher this morning,” National Bank Financial analyst Brian Milne said. Iron Bridge shares did surge immediately following the announcement of the cryptocurrency mining operation, jumping 16 per cent from 62 cents per share on the Toronto Stock Exchange to 72 cents each. The price has since fallen back to 65 cents per share. Previous : Corporate Divestiture: Wolf Coulee Resources Inc.
Corporate Divestiture: Wolf Coulee Resources Inc. Copyright © 2018 by Biocap. All rights reserved.